achel Estabrook reports for Colorado Public Radio about a new company creating greeting cards using algal ink, enabling the card to reveal different messages over several days. On the first day, for example, it might have a “happy birthday” message and a couple days later it could show a picture of a birthday cake. Scott Fulbright says he got the idea to use algae as ink when he was out shopping for a birthday card for his grandmother. “My grandma is 90 and loves a good greeting card,” he says. After driving around Fort Collins looking for a card, Fulbright got an idea. He’d been working in a lab at Colorado State University that is developing fuels using algae and thought: Why not use algae for something a lot simpler, and a lot more fun? Less than a year later, Fulbright and his colleague, Stevan Albers, are attempting to make the idea into a company. 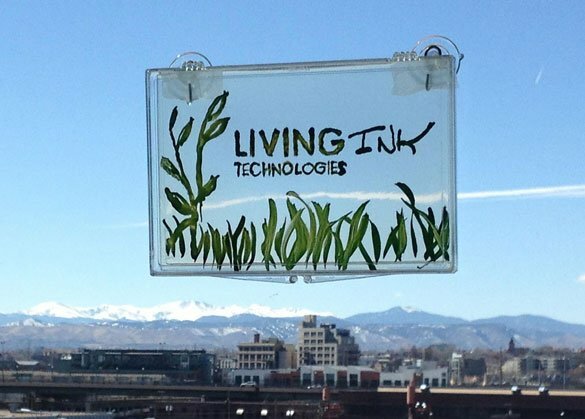 They’ve put a provisional patent on their concept and established a company named Living Ink Technologies. Now they’re pitching it to funders as part of the Blue Ocean Enterprises’ Collegiate Challenge, competing against teams from schools across Colorado. The first product Fulbright and Albers are developing is the algae greeting card. It doesn’t look much like a traditional greeting card but it can do a lot more, primarily revealing different messages over several days. Down the road they hope to use the technology to develop educational toys for kids. Albers is a former teacher. Fulbright says their products will expand and improve since they recently figured out how to make different colors by using different organisms. Now they have black and red in their arsenal, in addition to green. If Living Ink wins the Blue Ocean challenge, the entrepreneurs will score $20,000, plus a year of mentoring, to bring the idea to market.